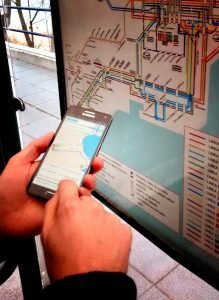 OpenTripPlanner for Android is an app that calculates travel routes using GTFS public transport data from Santander supplied by RISUM. Our experiment has ended and we are happy to have achieved most of the goals we set out at the beginning. All the data we have worked are available in the Urban Data Observatory from various assets. We hope they can be useful to other users of Organicity. In addition, the GTFS feeds are also available with information for users of the Santander bus service. The experimentation phase has been completed but RISUM continues. We would like to check that everything works properly, update some aspects and observe how the information we provide is being useful for urban mobility apps. Our aspiration is that users can use the information that RISUM provides to improve their daily trips around the city. To have all the information about the public transport of the city in Santander and use it in any situation. Finally, a observation. In the cities of the future the profile of the citizens is changing from consumer to producer of goods and services. We believe that projects like OrganiCity can really give push to the development of creative and innovative ideas of citizens and that have not yet been implemented in cities. Bugs, your time has come! Detrás de RISUM Project está el equipo de Alter Geosistemas formado por Emilio Gómez y Jesús Gómez. Este proyecto ha recibido financiación del programa de investigación e innovación Horizon 2020 de la Unión Europea en virtud del acuerdo de subvención nº 645198.